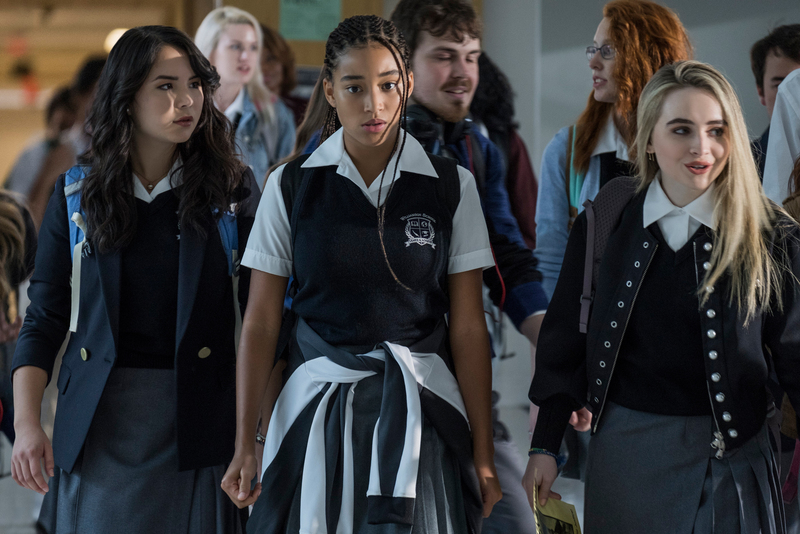 High school student Starr Carter (Amandla Stenberg) walks between two worlds, living with her parents in the crime-troubled and economically depressed fictional African-American neighborhood of Garden Heights, but attending a prestigious and predominantly white prep school along with her two brothers Seven (Lamar Johnson) and Sekani (TJ Wright). Starr is careful to keep her two lives cleanly demarcated, never being too white on her home turf, never being too ‘hood’ at school. 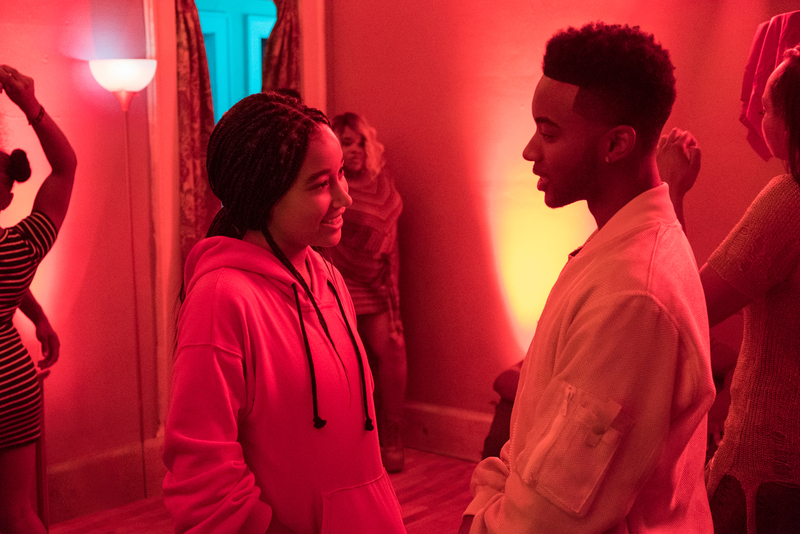 This becomes impossible when Starr is witness to the fatal shooting of her childhood friend Khalil (Algee Smith) at the hands of a cop during a routine traffic stop. Based on the young adult novel of the same name by Angie Thomas, The Hate U Give takes its title from a quote attributed to slain rapper Tupac Shakur: ‘The Hate U Give Little Infants F#cks Everyone,’ which acronyms down to ‘THUG LIFE.’ The quote functions as the film’s thesis, with director George Tillman Jr., Notorious (2009), and screenwriter Audrey Wells, A Dog’s Purpose (2017), mapping out how violence and hatred are self-perpetuating, cyclical things, spanning generations, race, and class divides. Yet The Hate U Give is no centrist ‘can’t we all just get along’ polemical. It’s a furious AF examination of the experience of being young, black, angry, and scared at this particular point in history, mediated through an absolutely stellar (yes, that’s a terrible pun) performance from Stenberg. Her Starr is smart, capable, studious, observant, funny, and cool — she should by all rights have a bright future ahead of her. Yet that future is in doubt from the opening moments of the film, which shows a younger Starr (Kai N. Ture) and her brothers being drilled by their ex-con father, Maverick (Russell Hornsby) on the Black Panther-recommended steps on how to survive when you’re stopped and questioned by police. Her very blackness makes her survival questionable. Which is why, in the hallowed halls of Wilmington Prep, far from the streets of Garden Heights, Starr tones down her black cultural identity, presenting herself as agreeable, likable, and generally generic. It’s a tactic that works until it doesn’t; when Starr’s white friends Hailey (Sabrina Carpenter) and Maya (Megan Lawless) get wind of Khalil’s death and take part in a protest walk out, it comes across as opportunistic virtue signaling; for them, Khalil isn’t a person, he’s an abstract. From here, the film follows Starr’s struggle with how to use her voice to speak for Khalil — or, indeed, whether to use her voice at all. 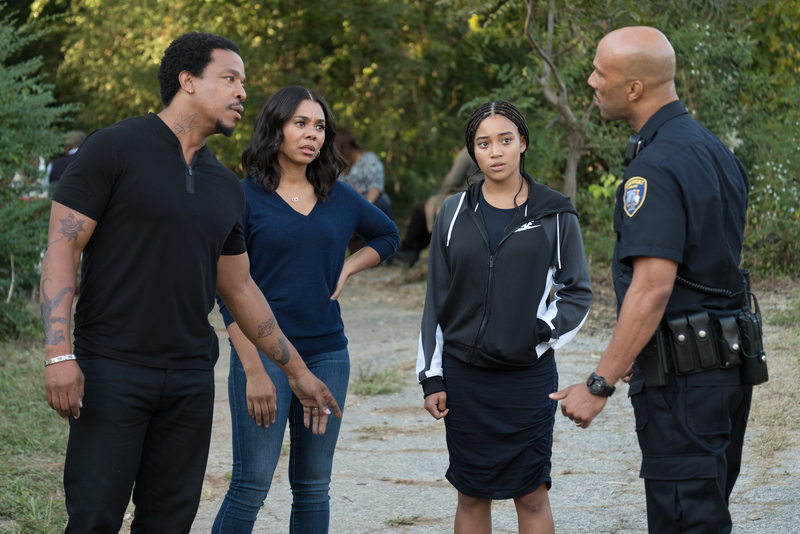 It’s not just her precarious social position at Wilmington at risk; Garden Heights crime boss King (Anthony Mackie), who runs the gang that Maverick used to be a member of, pressures her not to testify against Khalil’s killer — Khalil worked for him, and King doesn’t want any unwanted attention on his business. This sparks conflict between King and Maverick, who has raised his children to be smart, proud, and ambitious since he turned away from crime. Indeed, one of the elements that really impresses here is the way it spreads out from both its central character and its key incident, taking in a range of supporting figures and social dynamics that are complex and frequently at odds, never shying away from complications and paradoxes. We get a strong sense of who Maverick is; who Lisa (Regina Hall), Starr’s mother, is; how they fit into their community; where they’ve come from; the pressures under which they operate. We get a handle on Carlos (Common), Starr’s uncle, a black police officer, who, in a key scene breaks down how cops react to the possibility of being shot while on a traffic stop. We confront the fact that, for a kid like Khalil, dealing drugs for King was the best economic opportunity available to him, and grapple with the awful irony that his dealing had nothing to do with his death. By introducing nuance and doubt, contrasting views and conflicting strategies, The Hate U Give bypasses the more obvious messaging pitfalls and offers up few easy answers. It may be aimed at an adolescent audience, but it’s a mature film. But not a relentlessly grim one — it’s frequently very funny, with a strong line in snappy back and forth dialogue and some standout set pieces (the scene where Starr’s white boyfriend, played by Riverdale’s K.J. Apa, meets her father is killer). Tillman’s command of tone is simply exceptional, with scenes turning from comedy to drama to romance to tragedy on dime, but never in a way that feels jarring or forced. There’s a naturalism in play here that simply works subtle magic, capturing the moods and rhythms of life, putting us in this scenario and with these people in such a seamless way that, when the narrative does go big (the climax is a full-on riot, with black protestors facing off against cops after a maddening legal decision), you’re there with them — you’ve come all this way with them. Well, with Starr. 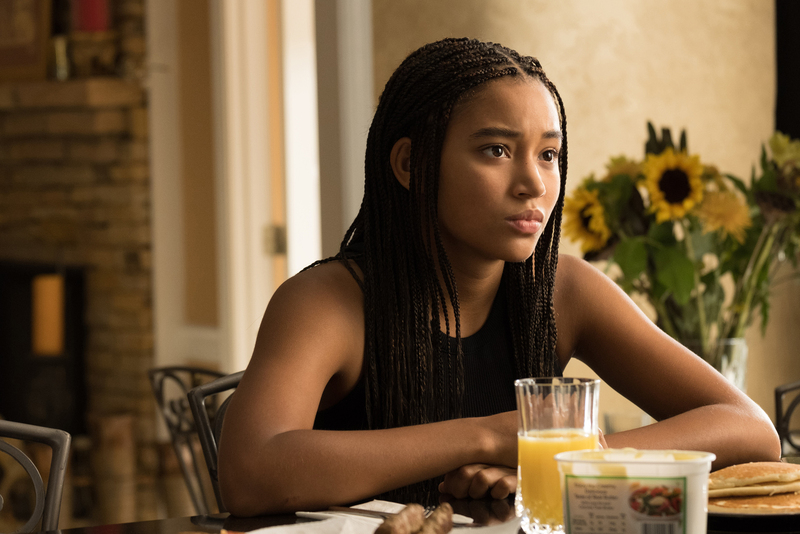 Make no mistake, while The Hate U Give is a brilliantly on point portrait of a community and a society in crisis, this is still Amandla Stenberg’s film. Since first coming to wide attention in The Hunger Games (2012), her profile has steadily risen in a fairly short period of time, moving towards some kind of crest. This film, if there’s any justice, is probably it. There’s an audible tone, a visible spark, like when you saw Jennifer Lawrence in Winter’s Bone (2010), or Brie Larson in Short Term 12 (2013). There’s probably an Oscar in Stenberg’s future if she can keep up this level of quality. In her hands, Starr is a mercurial, conflicted, but eminently relatable protagonist, charismatic and vulnerable and driven. She anchors the film, embodying its questions and contradictions, setting the emotional tone in every scene, and even manages to deliver voice-over narration that actually contributes rather than distracts. It’s a genuinely great performance. And The Hate U Give is a genuinely great film. Apparently it underperformed in the States, which is an absolute shame, and the fortunes of African-American films in the Australian market are always a bit fraught, but hopefully, it’ll find some purchase. Put aside any doubts you might have about what could look like typical YA multiplex fodder — this one is well worth your time.